Yep, I’m going to be lazy just cop part of the title of this release, well really more of an article than an out-and-out press release. Sounds like a pretty cool graphene transistor with potential real world applications. Since its discovery, graphene—an unusual and versatile substance composed of a single-layer crystal lattice of carbon atoms—has caused much excitement in the scientific community. Now, Nongjian (NJ) Tao, a researcher at the Biodesign Institute at Arizona State University has hit on a new way of making graphene, maximizing the material’s enormous potential, particularly for use in high-speed electronic devices. Along with collaborators from Germany’s Max Planck Institute, the Department of Materials Science and Engineering, University of Utah, and Tsinghua University, Beijing, Tao created a graphene transistor composed of 13 benzene rings. The molecule, known as a coronene, shows an improved electronic band gap, a property which may help to overcome one of the central obstacles to applying graphene technology for electronics. Tao is the director of the Biodesign Institute’s Center for Bioelectronics and Biosensors and electrical engineering professor in the Ira A. Fulton Schools of Engineering. The group’s work appears in the June 29 advanced online issue of Nature Communications. Eventually, graphene components may find their way into a broad array of products, from lasers to ultra-fast computer chips; ultracapacitors with unprecedented storage capabilities; tools for microbial detection and diagnosis; photovoltaic cells; quantum computing applications and many others. As the name suggests, graphene is closely related to graphite. Each time a pencil is drawn across a page, tiny fragments of graphene are shed. When properly magnified, the substance resembles an atomic-scale chicken wire. Sheets of the material possess exceptional electronic and optical properties, making it highly attractive for varied applications. “Graphene is an amazing material, made of carbon atoms connected in a honeycomb structure,” Tao says, pointing to graphene’s huge electrical mobility—the ease with which electrons can flow through the material. Such high mobility is a critical parameter in determining the speed of components like transistors. Producing usable amounts of graphene however, can be tricky. Until now, two methods have been favored, one in which single layer graphene is peeled from a multilayer sheet of graphite, using adhesive tape and the other, in which crystals of graphene are grown on a substrate, such as silicon carbide. In each case, an intrinsic property of graphene must be overcome for the material to be suitable for a transistor. As Tao explains, “a transistor is basically a switch—you turn it on or off. A graphene transistor is very fast but the on/off ratio is very tiny. ” This is due to the fact that the space between the valence and conduction bands of the material—or band gap as it is known—is zero for graphene. In order to enlarge the band gap and improve the on/off ratio of the material, larger sheets of graphene may be cut down to nanoscale sizes. This has the effect of opening the gap between valence and conductance bands and improving the on/off ratio, though such size reduction comes at a cost. The process is laborious and tends to introduce irregularities in shape and impurities in chemical composition, which somewhat degrade the electrical properties of the graphene. “This may not really be a viable solution for mass production,” Tao observes. Rather than a top down approach in which sheets of graphene are reduced to a suitable size to act as transistors, Tao’s approach is bottom up—building up the graphene, molecular piece by piece. To do this, Tao relies on the chemical synthesis of benzene rings, hexagonal structures, each formed from 6 carbon atoms. “Benzene is usually an insulating material, ” Tao says. But as more such rings are joined together, the material’s behavior becomes more like a semiconductor. Using this process, the group was able to synthesize a coronene molecule, consisting of 13 benzene rings arranged in a well defined shape. The molecule was then fitted on either side with linker groups—chemical binders that allow the molecule to be attached to electrodes, forming a nanoscale circuit. An electrical potential was then passed through the molecule and the behavior, observed. The new structure displayed transistor properties, showing reversible on and off switches. Tao points out that the process of chemical synthesis permits the fine-tuning of structures in terms of ideal size, shape and geometric structure, making it advantageous for commercial mass production. Graphene can also be made free of defects and impurities, thereby reducing electrical scattering and providing material with maximum mobility and carrier velocity, ideal for high-speed electronics. In conventional devices, resistance is proportional to temperature, but in the graphene transistors by Tao et al., electron mobility is due to quantum tunneling, and remains temperature independent—a signature of coherent process. The group believes they will be able to enlarge the graphene structures through chemical synthesis to perhaps hundreds of rings, while still maintaining a sufficient band gap to enable switching behavior. The research opens many possibilities for the future commercialization of this uncommon material, and its use in a new generation of ultra high-speed electronics. Via KurzweilAI.net — very cool! As always, I’ve included the entire KurzweilAI post. This one is a bit longer than usual. Scientists have programmed an autonomous molecular nanorobot made out of DNA to start, move, turn, and stop while following a DNA track. The development could ultimately lead to molecular systems that could be used for medical therapeutic devices and molecular-scale reconfigurable robots—robots made of many simple units that can reposition or even rebuild themselves to accomplish different tasks. Molecular robots, in theory, could be programmed to sense their environment (say, the presence of disease markers on a cell), make a decision (that the cell is cancerous and needs to be neutralized), and act on that decision (deliver a cargo of cancer-killing drugs). Or they could be programmed to assemble complex molecular products. “In normal robotics, the robot itself contains the knowledge about the commands, but with individual molecules, you can’t store that amount of information, so the idea instead is to store information on the commands on the outside,” says Nils G. Walter, professor of chemistry and director of the Single Molecule Analysis in Real-Time (SMART) Center at the University of Michigan in Ann Arbor. And you do that by “imbuing the molecule‘s environment with informational cues,” says Milan N. Stojanovic, a faculty member in the Division of Experimental Therapeutics at Columbia University. “We were able to create such a programmed or ‘prescribed’ environment using DNA origami,” explains Hao Yan, professor of chemistry and biochemistry at Arizona State University. DNA origami is a type of self-assembledstructure made from DNA that can be programmed to form nearly limitless shapes and patterns. Exploiting the sequence-recognition properties of DNA base pairing, DNA origami are created from a long single strand of DNA and a mixture of different short synthetic DNA strands that bind to and “staple” the long DNA into the desired shape. The origami used in the Nature study was a rectangle that was 2 nanometers (nm) thick and roughly 100 nm on each side. The researchers constructed a trail of molecular “bread crumbs” on the DNA origami track by stringing additional single-stranded DNA molecules, or oligonucleotides, off the ends of the staples. These represent the cues that tell the molecular robots what to do—start, walk, turn left, turn right, or stop, for example—akin to the commands given to traditional robots. To build the 4-nm-diameter molecular robot, the researchers started with a common protein called streptavidin, which has four symmetrically placed binding pockets for a chemical moiety called biotin. Each robot leg is a short biotin-labeled strand of DNA, “so this way we can bind up to four legs to the body of our robot,” Walter says. “It’s a four-legged spider,” quips Stojanovic. Three of the legs are made of enzymatic DNA, which is DNA that binds to and cuts a particular sequence of DNA. The spider also is outfitted with a “start strand”—the fourth leg—that tethers the spider to the start site (one particular oligonucleotide on the DNA origami track). “After the robotis released from its start site by a trigger strand, it follows the track by binding to and then cutting the DNA strands extending off of the staple strands on the molecular track,” Stojanovic explains. “Once it cleaves,” adds Yan, “the product will dissociate, and the leg will start searching for the next substrate.” In this way, the spider is guided down the path laid out by the researchers. Finally, explains Yan, “the robot stops when it encounters a patch of DNA that it can bind to but that it cannot cut,” which acts as a sort of flypaper. Using atomic force microscopy and single-molecule fluorescence microscopy, the researchers were able to watch spiders crawling over the origami, showing that they were able to guide their molecular robots to follow four different paths. One of my more popular all time posts is “Nanotechnology does have drawbacks” from September 2008 so that tells me people regularly search for the negative side of nanotech. The topic is something that heads toward higher level science and the term gets tossed around a lot — and a lot of the time incorrectly as far as that goes — so people are naturally curious about exactly what is nanotechnology and how is it good and bad. This survey, not surprisingly, found that providing information about the risks of nanotech increases public support among those who have heard of the field. Of course it also found support decreased among those who’d never heard the term once they were frightened by the potential drawbacks. I’m guessing scientific fact that sounds like scientific fiction can be pretty scary to someone who’s not familiar with what it can, and might, do both positive and negative. A new national survey on public attitudes toward medical applications and physical enhancements that rely on nanotechnology shows that support for the technology increases when the public is informed of the technology’s risks as well as its benefits – at least among those people who have heard of nanotechnology. The survey, which was conducted by researchers at North Carolina State University and Arizona State University (ASU), also found that discussing risks decreased support among those people who had never previously heard of nanotechnology – but not by much. The survey was conducted by Cobb in collaboration with Drs. Clark Miller and Sean Hays of ASU, and was funded by the Center for Nanotechnology in Society at ASU. However, talking about risks did not boost support among all segments of the population. Those who had never heard of nanotechnology prior to the survey were slightly less supportive when told of its potential risks. In addition to asking participants how much they supported the use of nanotechnology for human enhancements, they were also asked how beneficial and risky they thought these technologies would be, whether they were worried about not getting access to them, and who should pay for them – health insurance companies or individuals paying out-of-pocket. The potential enhancements addressed in the survey run the gamut from advanced cancer treatments to bionic limbs designed to impart greater physical strength. One segment of participants was shown an image of an unrealistic illustration meant to represent a nanoscale medical device. A second segment was shown the image and given a “therapeutic” framing statement that described the technology as being able to restore an ill person to full health. A third segment was given the image, along with an “enhancement” framing statement that described the technology as being able to make humans faster, stronger and smarter. Two additional segments were given the image, the framing statements and information about potential health risks. And a final segment of participants was not given the image, a framing statement or risk information. The survey found that describing the technology as therapeutic resulted in much greater public support for the technology, as well as a greater perception of its potential benefits. The therapeutic frame also resulted in increased support for health insurance coverage of nanotech treatments once they become available, and increased concerns that people wouldn’t be able to afford such treatments without insurance coverage. “These findings suggest that researchers, policymakers and industries would be well advised to focus their research efforts on developing therapeutic technologies, rather than enhancements, because that is the area with the greatest public support,” Cobb says. The use of the nanotech image did not have a significant overall impact on participants’ support, but did alarm people who were not previously familiar with nanotechnology – making them less likely to support it. The survey was conducted by Knowledge Networks between April 2-13. The survey included 849 participants, and has a margin of error of plus or minus 3.3 percent. NC State’s Department of Political Science is part of the university’s College of Humanities and Social Sciences. This illustration was used to represent a nanoscale medical device in the national survey on public attitudes towards the use of nanotechnology for human enhancement. I’ve been a longtime supporter of SETI’s efforts, but I also welcome any new ideas in the search for extraterrestrial intelligence. These ideas from Paul Davies sound worthwhile. The Search for Extraterrestrial Intelligence (SETI) has been dominated for its first half century by a hunt for unusual radio signals. But as he prepares for the publication of his new book The Eerie Silence: Are We Alone?, Paul Davies tells Physics World readers why bold new innovations are required if we are ever to hear from our cosmic neighbours. Writing exclusively in March’s Physics World, Davies, director of BEYOND: Center for Fundamental Concepts in Science at Arizona State University in the US, explains why the search for radio signals is limited and how we might progress. Questioning the idea of an alien civilisation beaming radio signals towards Earth, Davies explains that even if the aliens were, say, 500 light years away (close by SETI standards), the aliens would be communicating with Earth in 1510 – long before we were equipped to pick up radio signals. While SETI activity has been concentrated in radio astronomy, from Frank Drake’s early telescope to the more recent Allen Telescope Array, astronomers have only ever been met with an (almost) eerie silence. Davies suggests that there may be more convincing signs of intelligent alien life, either here on Earth in the form of bizarre microorganisms that somehow found their way to Earth, or in space, through spotting the anomalous absence of, for example, energy-generating particles that an alien life form might have harvested. Following the publication of his book, The Eerie Silence, Davies will be giving a Physics World webinar at 4pm (BST) on Wednesday 31 March. You can view the webinar live at http://www.physicsworld.com or download it afterwards. Getting intimate with Mars – robotic rovers are starting to unravel the secrets of the red planet but, according to one NASA expert, we would discover so much more if we brought samples back to Earth. The Hollywood actor Alan Alda, star of M*A*S*H and The West Wing, who has a deep and passionate interest in science, is now part of an innovative US project to help scientists to communicate. Yep, this is a total release dump and there’s one more to come. I couldn’t resist because a slew of very cool news came out of the 2009 AAAS Annual Meeting today. “Life as we know it appears to have had a single common ancestor, yet, could life on Earth have started many times? Might it exist on Earth today in extreme environments and remain undetected because our techniques are customized to the biochemistry of known life?” asks Davies, who also is the director of the BEYOND Center for Fundamental Concepts in Science at Arizona State University in the College of Liberal Arts and Sciences. “If a biochemically weird microorganism should be discovered, its status as evidence for a second genesis, as opposed to a new branch on our own tree of life, will depend on how fundamentally it differs from known life,” wrote Davies in the Nov. 19, 2007, issue of Scientific American. Davies, whose research is steeped in the branches of physics that deal with quantum gravity – an attempt to reconcile theories of the very large and the very small – is a prolific author (27 books, both popular and specialty works) and is a provocative speaker (he delivered the 1995 Templeton Prize address after receiving the prestigious award for initiating “a new dialogue between science and religion that is having worldwide repercussions”). Man, this study is producing a lot of press releases. I’ve blogged here and here so far, and now here’s more food for thought. Two new National Science Foundation (NSF)-sponsored research studies say public acceptance of the relatively new, nature-altering science of nanotechnology isn’t a foregone conclusion. Instead, the studies indicate continued concern. Researchers at Yale University say that when people learn about this novel technology they become sharply divided along cultural lines, while a separate study led by researchers at the University of Wisconsin-Madison and Arizona State University says nanotechnology seems to be failing the moral litmus test of religion. Federal entities are looking into safety and public acceptance issues surrounding nanotechnology because of its ability to alter matter on an atomic and molecular scale. The potential societal benefits of using nanotechnology to create new materials and devices for medicine, electronics and energy production could be huge. But the idea of creating them through molecular manipulation leaves some people apprehensive. “Evidence shows that there is much room for improvement in efforts to communicate about the environmental, health, and safety impacts of nanotechnology,” said Robert E. O’Connor, NSF program manager for decision, risk and management sciences. The Yale study, part of their Cultural Cognition Project, surveyed 1,500 Americans, the majority of whom were unfamiliar with nanotechnology. Researchers gave participants balanced information about its risks and benefits. Upon seeing it, study participants became highly divided on the technology’s safety compared to a group that was not shown the same information. According to Dan Kahan, the Elizabeth K. Dollard Professor at Yale Law School and lead author of the study, people’s cultural values determined how they responded. “People who had more individualistic, pro-commerce values, tended to infer that nanotechnology is safe,” said Kahan. People more worried about economic inequality saw the same information as implying that nanotechnology is likely to be dangerous. A separate study conducted in the United States and Europe indicates that people with religious views see nanotechnology as less morally acceptable, compared with people who live in more secular societies. According to the study, the United States and a few European countries where religion plays a larger role, notably Italy, Austria and Ireland see the potential of nanotechnology to alter living organisms or inspire synthetic life as less morally acceptable. In more secular European societies such as France and Germany, people are less likely to see nanotechnology as morally suspect. “Our findings show that the public no longer just turns to scientists for answers about the science, but also for answers about its social implications,” he said. “In other words, they want to know not only what can be done, but also what should be done. The more prepared scientists are to answer both questions, the more credible their societal leadership will be on issues like nanotechnology,” said Scheufele, who co-authored the study with Elizabeth Corley, School of Public Affairs at Arizona State. According to O’Connor, both studies highlight the need for specific public education strategies that consider citizens’ values and predispositions. “Understanding that people make decisions about technology through the prisms of their personal values will be important to take into account if we are to accurately communicate the risks and benefits of innovations like nanotechnology to the public,” said O’Connor. It’s estimated that nanotechnology will be a $3.1 trillion global industry by 2015. Both studies can be found in the Dec. 7, 2008, issue of the journal Nature Nanotechnology. From KurzweilAI.net — This is interesting nanotechnology news. Using cells to create DNA-based nanostructures inside a cell. Arizona State University and New York University researchers are using cells as factories to make DNA-based nanostructures inside a living cell. They are using a phagemid, a virus-like particle that infects a bacteria cell. Once inside the cell, the phagemid uses the cell just like a photocopier machine. By theoretically starting with just a single phagemid infection, and a single milliliter of cultured cells, they found that the cells could churn out trillions of the DNA junction nanostructures. 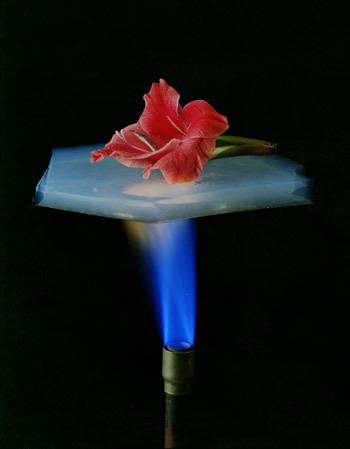 Aerogels are pretty amazing substances with many uses. This press release covers using X-ray diffraction to get a 3D nanoscale look inside aerogels. A multi-institutional team of scientists has used beamline 9.0.1 at the Advanced Light Source to perform high-resolution x‑ray diffraction imaging of an aerogel for the first time, revealing its nanoscale three-dimensional bulk lattice structure down to features measured in nanometers, billionths of a meter. Aerogels, sometimes called “frozen smoke” or “San Francisco fog,” are nanoscale foams: solid materials whose sponge-like structure is riddled by pores as small as nanometers across and whose strength is surprising, given their low density. Many porous materials are extraordinary for their properties as insulators, filters, and catalysts; they are used to produce clean fuels, to insulate windows and even clothing, to study the percolation of oil through rock, as drug-delivery systems, and even to cushion the capture of high-velocity comet fragments in outer space. Team members from Lawrence Livermore National Laboratory, the University of California at Davis, Arizona State University, Argonne National Laboratory, and Berkeley Lab performed the x‑ray diffraction imaging and have published their results online in Physical Review Letters, available to subscribers at http://link.aps.org/abstract/PRL/v101/e055501. One way to study aerogels and other nanofoams is with electron microscopy, which can image only thin, two-dimensional slices through the porous structure of the material. Another method is straightforward x-ray microscopy, using zone plates as “lenses”; microscopy can penetrate a sample but has difficulty maintaining resolution at different depths in the material. Small-angle x‑ray scattering (SAXS) can also gather limited structural information from finely powdered aerogels, but SAXS cannot provide full three-dimensional information. None of these techniques can capture the 3-D internal structure of nanofoam samples measured in micrometers, a few millionths of a meter across. X-ray diffraction approaches the problem differently. A laser-like x-ray beam passes all the way through the sample and is diffracted onto a CCD detector screen; diffraction patterns are repeatedly stored while the sample is moved and rotated. A typical series requires approximately 150 views in all. The individual diffraction patterns are then processed by a computer. The way the photons in the beam are redirected from each component of the structure is different for each orientation, and comparing their intensities serves to position that component precisely in three-dimensional space. 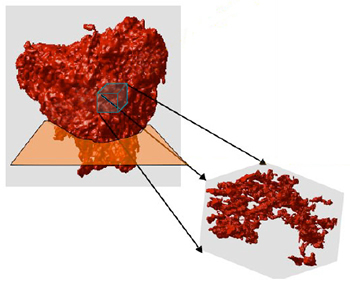 Thousands of iterations are required – in the present study, team member Anton Barty of Livermore led the solution of almost 100 million measured intensities, as opposed to the 100 thousand or so typical of, say, protein crystallography – but the end result is a 3‑D image of the tiny sample at nanometer-scale resolution. Foam-like structures are described in terms of interconnecting lattice beams and the nodes where they intersect. These elements became vividly apparent in the reconstructed 3-D images of the aerogel used in the imaging at the ALS, which was made of tantalum ethoxide (Ta2O5), a ceramic material proposed for cladding capsules of hydrogen isotopes for inertial-confinement fusion experiments being pursued at Livermore. Of the theories that seek to explain this phenomenon, one is the “percolation” model, in which fragments become detached from the load-bearing structure and add mass without contributing to strength. The alternate “heterogeneities” model proposes that the structure is increasingly riddled with defects like micron-sized holes and buckles more easily. A third theory is the “diffusion-limited cluster aggregation” model: blobs of material accumulate that are connected by thin links, instead of sturdy beams between nodes. What the team observed in their 3-D images of the tantalum ethoxide aerogel was a “blob-and-beam” structure consistent with the third model, that of diffusion-limited cluster aggregation. The observed structure explained the relative weakness of the low-density material and also suggested that changes in methods of preparing aerogels might improve their strength. One is time. At present, each sample takes months of work. After preparation, the experiment first requires one or two days of mounting, rotating, and exposing the sample to the x-ray beam, about a minute per view – because of a slow detector – for 150 views. There follow weeks of computation time. “And after all this, you can find out the sample was no good, so you have to start over,” Marchesini says. Improved sample handling, faster detectors, and a beamline dedicated to x-ray diffraction are principal goals. The Coherent Scattering and Diffraction Microscopy (COSMIC) facility, a top priority in the ALS strategic plan, will provide intense coherent x-rays with full polarization control. This work was principally supported by the Department of Energy through a variety of grants, by Laboratory Directed Research and Development programs at Livermore, and additionally by the National Science Foundation. “Three-dimensional coherent X-ray diffraction imaging of a ceramic nanofoam: determination of structural deformation mechanisms,” by A. Barty, S. Marchesini, H. N. Chapman, C. Cui, M. R. Howells, D. A. Shapiro, A. M. Minor, J. C. H. Spence, U. Weierstall, J. Havsky, A. Noy, S. P. Hau-Riege, A. B. Artyukhin, T. Baumann, T. Willey, J. Stolken, T. van Buuren, and J. H. Kinney, appears in Physical Review Letters online publication and is available to subscribers at http://link.aps.org/abstract/PRL/v101/e055501. A 500-nanometer cube of aerogel from the interior of the 3-D volume, reconstructed by x-ray diffraction. The foam structure shows globular nodes that are interconnected by thin beam- like struts. Approximately 85 percent of the total mass is associated with the nodes; relatively little of the mass is in the load-bearing links. From KurzweilAI.net, nanotrees are a new type of nanowire and Arizona State researchers have created the fastest nanomotor. University of Wisconsin-Madison researchers have discovered a new way of growing nanowires that leads to “nanopines”–elaborate pine-tree-shaped nanowires–caused by a “screw” dislocation, or defect, in their crystal structure. Dislocations are fundamental to the growth and characteristics of all crystalline materials, but this is the first time they’ve been shown to aid the growthof one-dimensional nanostructures. Engineering these dislocations may allow scientists to create more elaborate nanostructures, and to investigate the fundamental mechanical, thermal and electronic properties of dislocations in materials. Arizona State University researchers have developed a new generation of nanomotors with an average speed of 60 micrometers per second. Existing catalytic nanomotors–made with gold and platinum nanowires and fueled with hydrogen peroxide–have top speeds of about 10 micrometers per second. The new design adds carbon nanotubes to the platinum (boosting the average speed) and spikes the hydrogenperoxide fuel with hydrazine to increase the nanomotor’s top speed to 200 nanometers per second. Arizona State University’s Biodesign Institute scientist John Chaput and his research team have made the first synthetic self-assembled nanostructures, composed entirely of glycerol nucleic acid (GNA), a synthetic analog of DNA. With GNA, the five carbon sugar commonly found in DNA (deoxyribose) is substituted by glycerol, which contains just three carbon atoms. Unlike DNA and proteins, which have evolved to exist only as right-handed, the GNA structures are “enantiomeric” molecules (both left and right-handed). The ability to make mirror image structures opens up new possibilities for making nanostructures.